Winston-Salem progressive metal band Stellar Circuits released their newest album Ways We Haunt in November of last year, and we’ve teamed up with drummer Tyler Menon to premiere this official drum playthrough for their track “The Polar Dream”! 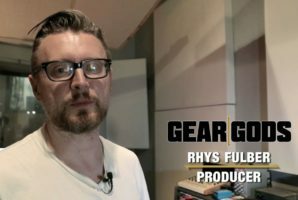 The dude knows his way around a drum kit (that’s putting it lightly), and this tune is all about the beat, so sit back, relax, and enjoy this one, only right here, on Gear Gods! With a Maynard-like singing style reminiscent of Tool’s “The Pot”, vocalist Ben Beddick kicks things off while Tyler sets the pacing behind the kit. The track has this unique back-and-forth structure; fluidly alternating between progressive rock and metal sections. This form lends itself to showcasing Tyler’s drumming skills quite nicely, from jazz-inspired rhythms to full-on prog metal double bass grooves. Tyler does it all and looks like he has a blast while doing it, so you’ll probably enjoy this one as much as the dude enjoyed playing it. “To this day, ‘The Polar Dream’ is a favorite of mine and the rest of the guys to play live. It’s a trip through a lot of different feelings from start to end. It goes from foreboding, to chill and introspective, to total chaos, to triumphant and almost major sounding. It also has some of my favorite drum parts on the album. I played around with some jazzier stuff in the chill sections, like paradiddles and double stroke rolls between the ride/hats and snare, and then threw in some polyrhythmic stuff in the heavier sections. Be sure to get Ways We Haunt here.